Accueil Produits Bande originale La bande originale de “Les petits champions”. La bande originale de “Les petits champions”. Sortie : 25 mars 1994. Film : Les petits champions. Deux albums existent : un avec des chansons du film, l’autre avec les musiques. 1. We Will Rock You (par Queen). 2. You Ain’t Seen Nothin Yet (par Poorboys). 3. Rock And Roll Part 2 (par Gary Glitter). 4. Mr. Big Stuff (par Martha Wash). 5. The Mighty Ducks Suite (par David Newman). 6. Whoomp! (There It Is) (par Tag Team). 7. Wild Thing (par Troggs). 8. Zamboni (par Gear Daddies). 9. We Are The Champions (par Queen). 10. Rock The Pond (par John Bisaha). 1. Opening Credits, The Shot – 3:39. 2. Winning Streak – 2:17. 4. Fulton Shoots – 1:05. 6. Teach Them to Fly – 1:55. 7. Chilli Con Doggy – 2:01. 8. Ice Sculptures Kiss – 1:14. 9. Limousine Invasion – 1:39. 10. Han’s Sportshop – 1:07. 11. The Running Pranksters – 0:45. 12. 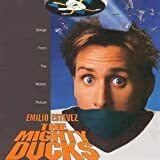 Becoming the Mighty Ducks – 1:04. 13. Sticking With the Team – 1:08. 14. Good Sportsmanship – 1:13. 15. First Win – 1:36. 16. Flying V – 3:23. 17. Ducks Win – 4:03. 18. Fake An Injury – 0:36. 19. The Game Starts – 1:16. 20. Banks Injured, Getting Back in the Game – 3:06. 21. Case Won – 1:24. 22. Charlie (Alternate. – 1:35.